How much physical activity should you be doing? Eating a healthy, well-balanced diet means eating food from a variety of food groups to get the energy and nutrients that your body needs. Fats are an important part of your diet. They’re a good source of energy – in fact, they provide you with more than twice the energy as the same amount of protein or carbohydrate. We need vitamins and minerals for our bodies to function properly, and you can find them in lots of different foods. Fibre is an essential part of a healthy diet. It helps to keep your digestive system in good working order, and has many other important health benefits. Protein is an important part of a healthy diet. It's essential for growth and repair in your body, as well as having a number of other important functions. Carbohydrates are your body’s main source of energy. You use them to fuel activity in your muscles and to keep your brain and other organs working properly. Find out how one of our health assessments can help you understand your health, identify future potential health risks, and offer practical support and advice for a healthier you. But don't just take our word for it; here's some feedback from our readers. We know that our users want the right information at the right time, in the way that suits them. So we review our content at least every three years to keep it fresh. And we’re embracing new technology and social media so they can get it whenever and wherever they choose. You will see the Information Standard quality mark on our content. This is a certification programme, supported by NHS England, that was developed to ensure that public-facing health and care information is created to a set of best practice principles. It uses only recognised evidence sources and presents the information in a clear and balanced way. The Information Standard quality mark is a quick and easy way for you to identify reliable and trustworthy producers and sources of information. Certified by the Information Standard as a quality provider of health and social care information. 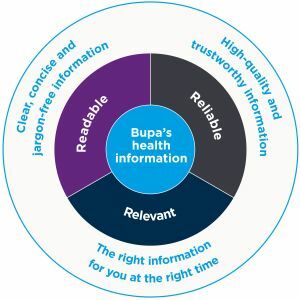 Bupa shall hold responsibility for the accuracy of the information they publish and neither the Scheme Operator nor the Scheme Owner shall have any responsibility whatsoever for costs, losses or direct or indirect damages or costs arising from inaccuracy of information or omissions in information published on the website on behalf of Bupa.